The Ferrari 250 GTO is a GT car which was produced by Ferrari from 1962 to 1964 for homologation into the FIA's Group 3 Grand Touring Carcategory. The numerical part of its name denotes the displacement in cubic centimeters of each cylinder of the engine, whilst GTO stands for "Gran Turismo Omologata", Italian for "Grand Touring Homologated." When new, the GTO commanded an $18,000 purchase price in the United States, and buyers had to be personally approved by Enzo Ferrari and his dealer for North America, Luigi Chinetti. 36 cars were made in the years '62/'63. In 1964 'Series II' was introduced, which had a slightly different look. Three such cars were made, and four older 'Series I' were given a 'Series II' body. It brought the total of GTOs produced to 39. 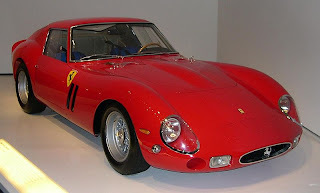 In 2004, Sports Car International placed the 250 GTO eighth on a list of Top Sports Cars of the 1960s, and nominated it the top sports car of all time. Similarly, Motor Trend Classic placed the 250 GTO first on a list of the "Greatest Ferraris of all time".